336 p., 37 ill. (10 colored), 14,8 x 21,0 cm. Vorlesungen zu einer neuen psychoanalytischen Theorie der Homosexualität. Edited form the estate by the Judith Le Soldat Foundation. ›Grund zur Homosexualität‹ (›Grounds for Homosexuality‹) advances a radically new approach to the psychological processes that participate in the emergence of what we call sexual orientation. Not only are conventional ideas of homo- and heterosexuality called into question; we also encounter an entirely new basis for interpreting what we mean by masculinity and femininity. 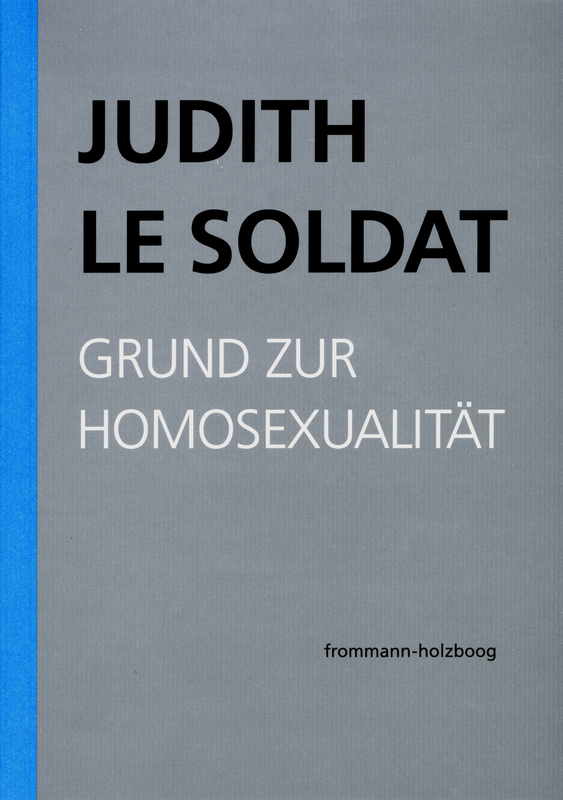 Judith Le Soldat thus elaborates a theory in this book that is a great deal more than a theory of homosexuality. Her precise analysis of the phenomenon of homosexuality provides entirely new, hitherto unknown insights into the very foundations of how the human soul functions.